PACLINE Overhead Conveyors is dedicated to designing, manufacturing, installing and servicing high quality overhead conveyor systems. Since 1979, PACLINE Overhead Conveyors has installed thousands of systems with over 2 million feet of conveyors in over thirty countries around the world. For over 35 years, we have been providing material handling solutions to a wide range of industries from automotive parts to empty carton handling. 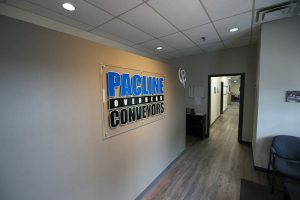 PACLINE has headquarters in Mississauga, Ontario (CANADA) and an engineering office and warehouse in Buffalo, New York (USA). At PACLINE quality goes beyond supplying the best overhead conveyors in the industry. From concept development and design to manufacturing and final installation, PACLINE aims to exceed your expectations. PACLINE engineers provide full technical service, before, during and after installation of our equipment. Through continual upgrading of our computer-aided design system, customers are assured accurate and modern layout and installation drawings. Continuous product development ensures that PACLINE provides stat-of-the-art designs. Contact PACLINE and find out how we can help you with a highly successful conveyor system.